Posted on Friday, May 4th, 2012 at 9:00 am. Every once in a while, I take a very careful look at the by-lines and review content of some of my favourite literary publications. Sometimes I do so because I think I might have caught wind of a trend, in terms of coverage, and want to see if my theory pans out. Sometimes I just look because I am curious and it occurs to me to do so. 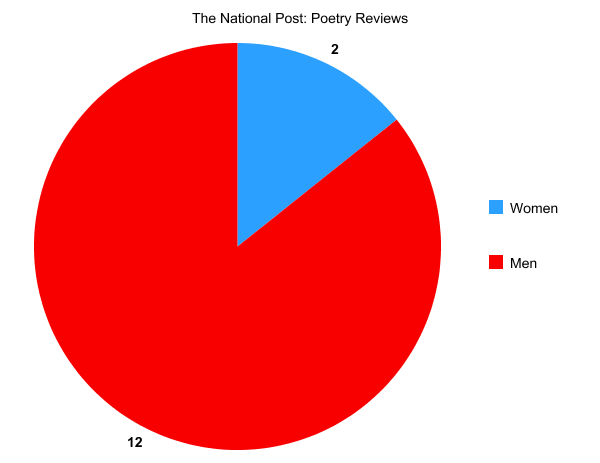 I do this because I am actively interested in how much coverage women’s writing is getting in the media all year round, and not just when the Vida Count comes out. I do it because I think keeping tabs on exactly who is writing about books, and what books they are writing about, is something that demands careful attention. For the entire piece, which includes a list of all the books by Canadian women that might have been reviewed, skip hop over to Ms Z’s site.